Echomac® UT system inspecting stainless steel and titanium heat exchanger tube. 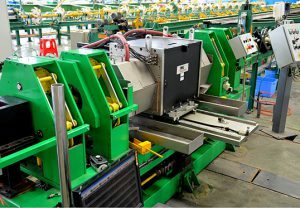 Includes MAC inlet and outlet conveyor system. These types of tubes are commonly found in heat exchangers used in oil refineries and for other large chemical processes, power generation and many other high liability, high down time cost applications. Many of these situations are also are high pressure applications. In heat exchangers tubes are subjected to mechanical stresses due to thermal driven linear contraction and expansion of the tube length and due to radial thermal gradients in the tubes. Heat exchanger tubes are also susceptible to any stress from the high pressures of the fluids themselves. Trained and experienced MAC® technicians can help you to determine which test method should be used, based upon each method’s inherent capabilities and limitations, as well as your unique requirements. 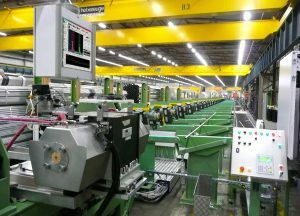 Multimac® is MAC’s eddy current system. Many heat exchanger tubes are tested with encircling coil eddy current method only. Echomac® Ultrasonic Rotary Systems can cover a large OD range of longitudinally welded or seamless precision-drawn tubes. These machines are capable of testing tubes at the high test level mandated by the application and also the throughput rate required to match some large quantity heat exchanger tube orders. At high throughput rates, untested ends can be limited to 25mm to 50mm depending upon diameters and conditions. Our systems feature Echomac® FD-6 electronics with up to 32 channels and full network support for remote viewing and control.